Earlier this year, a husband and wife from Lampasas, Texas (Lampasas is 30 miles west of Killeen, Texas) contacted me in regards to a new 2008 Jeep Liberty that they purchased in 2008 that keeps manifesting an abnormal knocking noise near the engine area. Like most lemon law victims, they took the vehicle in numerous times and the problem never went away. 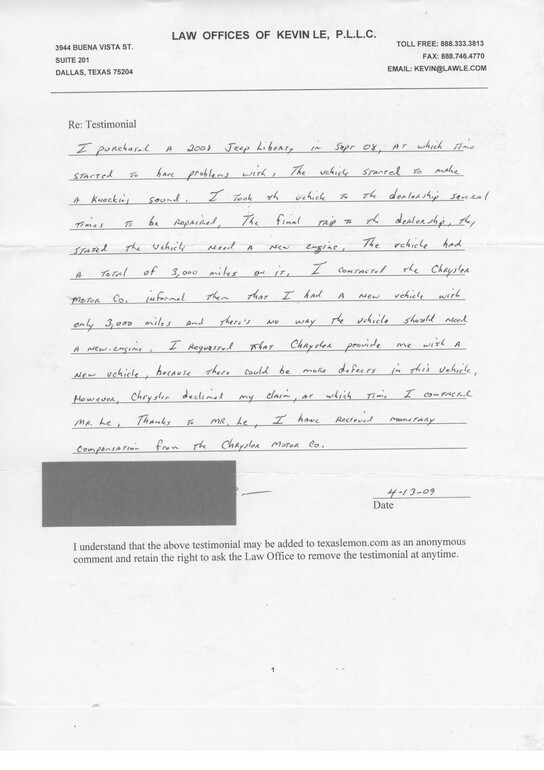 After months of frustration in dealing with the Chrysler service centers, the couple called my office and I took on their case. I am happy to report that the the case settled in favor of my clients and they are now happy with the results of their lemon law claim. This is the link to their testimonial. (Look for this testimonial entry: T. and D. B., Lampasas, Texas, April 13, 2009).